Sometimes drinking plain water just does not cut it. So what is the solution? Fruit-infused water! 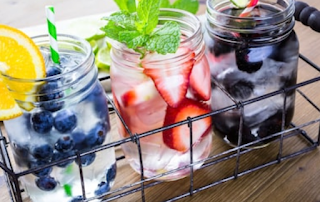 Infused waters are quick and easy to make. Plus it is refreshing and nutritious. You can use any fresh fruit (except bananas), spices and herbs, to turn your plain water into a refreshing, healthy and flavored drink. 2. Place the fruits, herbs and spices in the bottom of the jar. Then mash-upthe fruit and stir using a wooden spoon. 2. Fill jar with water and taste. If you like it a bit sweeter, add some agave and mix until dissolved. 3. Enjoy or refrigerate overnight for maximum flavor.